This essay originally ran in the Should I Laugh Or Cry newsletter. I had the same yellow-trimmed, melamine-topped writing desk in an online shopping cart for two weeks. I wasn't waiting for a price reduction. I wasn't waiting for a paycheck. I wasn't even torn. I knew this was the desk I wanted. 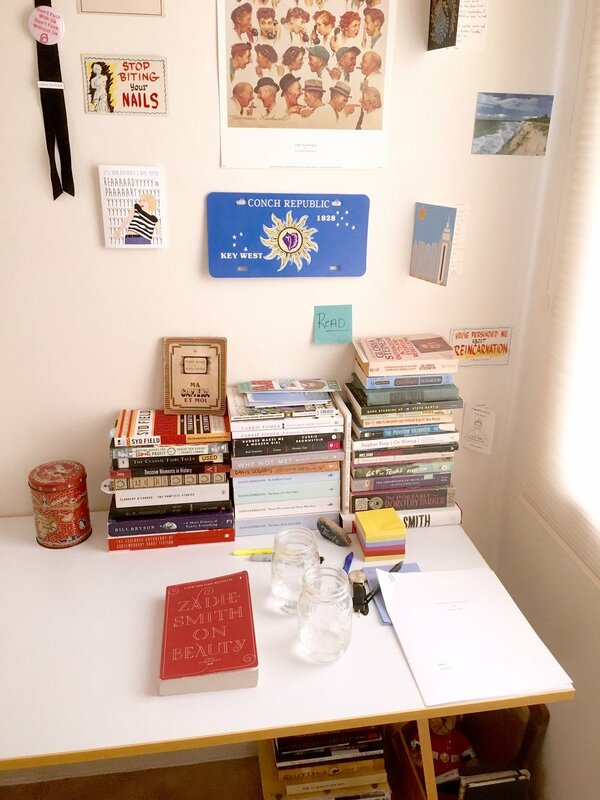 I had resisted creating a workspace for myself for over a year. I thought I didn’t need it, that I preferred the transient existence of a laptop tote slung over a weak shoulder; that I relished a toss in the free-to-write-where-I-wish hay. I fancied myself a bird in flight. A migrating creature capable of great things no matter the setting. Sure, I could churn out scripts and novels and stories from whatever alleyway in which I ended up. It could be city-dank, it could be Copenhagen-pristine, the only important thing in my creativity equation wasn’t space, it was me - it was my mind. The body is but a vessel, the mind is the wind. Now blow upon my canvas, muse! Sail! I can’t say this spaceless logic was without reason. I’ve owned a desk before. It quickly became a shelf, and then more obviously: a closet. When I moved to LA, I was determined to live without. But by evidence of this post, you may determine that I have not created the next great American tale while lying face-down on a dirty sidewalk. But what I have learned is this: I need a space. I require something dedicated. Not as a switch or lever, but as a roof and a door. What I’ve learned is that I’ve been flying without an assigned seat. It works, but standing in the aisle on an eight-hour flight is looked down upon and people will yell. It is tiring. It is unnecessary. I like organization. I enjoy list-making. I am a post-it note lobbyist, as you know. But I’ve actively ignored that part of myself when it comes to the most important part of myself. The idea that I could freewheel my creativity via a bohemian open-relationship with where I create was somewhat naive, I admit. Dedication is a virtue, and a dedicated space begets that virtue, I think. I no longer want the distraction of looking for a place to set down my things and begin to work. I don’t need to sift through a crowd of latte-drinkers just so I can gather myself on the page. I want a place that waits for me. One that I don’t have to create anew every time I feel inspired. My inspiration should flow into more important tasks, direct. Like this poem I’m working on about litigious snails. Or an ode to pizza. My inspiration should be put directly towards pizza. So I bought the desk. Reader, buy the damn desk.